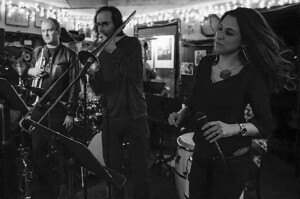 Los Dukes is a new 9 piece band arranged and directed by Gabriela Anders, featuring songs from the Duke Ellington’s catalog done in wildly distinctive Latin American styles. A Latina’s tribute to the music of Duke Ellington. 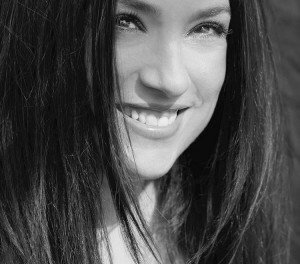 Gabriela Anders is one of the most accomplished and appealing contemporary vocalists creating today. Her debut album on Warner Jazz, “Wanting,” enjoyed much success and critical praise. 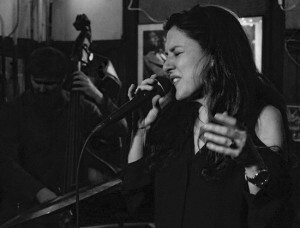 Her new band, Los Dukes, pays loving tribute to the elegant GENIUS of Duke Ellington and includes some of the best Latin Jazz players on the New York scene. ​Bobby Sanabria: 7 times Grammy nominated artist: drummer, percussionist, composer, arranger, recording artist, producer, conductor, educator, activist, multi-cultural warrior. He has played and recorded with artists such as Dizzy Gillespie, Tito Puentes, Arturo Sandoval, Mario Bauza. Orestes Abrantes on percussion: Originally from Cuba, Oreste has performed with Tito Puente, Eddie Montalvo, Bobby Sanabria and Willy Torres. Edward Perez on bass: Hailed by Jazz Times magazine for his “great dexterity,” bassist and composer Edward Perez has performed with jazz greats such as Paquito D’Rivera, Lee Konitz, Mark Turner, Lionel Loueke. Matthew Jondrell on Trumpet: Born in Australia, Mat Jodrell is one of the leading voices on the trumpet today. He is currently on faculty at the Julliard School of Music, NYC. Silvano Monasterios on piano: Composer and producer originally from Venezuela. He has worked with Ira Sullivan, Larry Coryell, Paquito D’Rivera, Dave Valentin, Arturo Sandoval, Nestor Torres, David Lee Roth. His last two CDs are entitled “Unconditional” and “Partly Sunny” and were released on Savant Records. Chris Washburne on trombone: Chris has been hailed as “One of the best trombonists in salsa…” by The New York Times and “one of the most important trombonist performing today” by JazzChicago magazine. His latest release, “Low Ridin’,” received rave reviews. How did Los Dukes start? Is it difficult for a woman musician to lead an all-male band? “I was a bit insecure at first as an arranger – not really from a gender perspective but from lack of experience – but I soon accepted that there would be a period of try, try, learn, then try some more. Each arrangement got better and better. It was thrilling! The guys were super supportive. What kind of rhythms do you explore in Los Dukes? What’s next for Los Dukes?